Today it was just the kids and I until late afternoon. Gary was golfing, so the kids planned our own day. We hung out mostly outside. 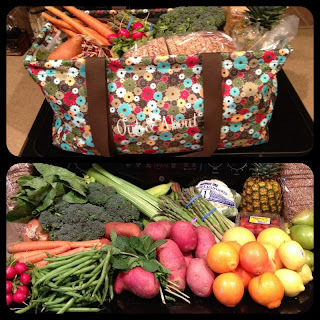 Our morning started with us picking up our produce from the coop. We got some amazing goodies! I got so much stuff and it all fit in my Thirty-One large utility tote. I love that big thing. I have used it WAY more than I thought I would. Auntie came over for a visit. 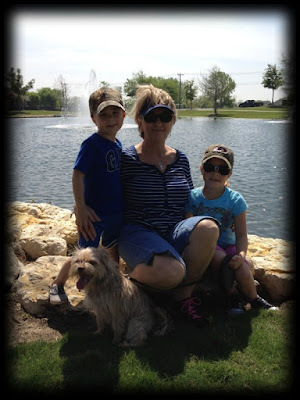 We were so happy to see her!I love this picture of Auntie and the kiddos & Daisy. 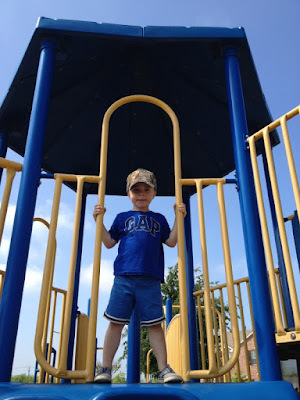 We played at the park and enjoyed the wonderful weather. Hayden is not matchy matchy in this picture, but I am learning to let the little things go. Actually I am happy he is picking out his own clothes and dressing himself. At least he picked all blue right? 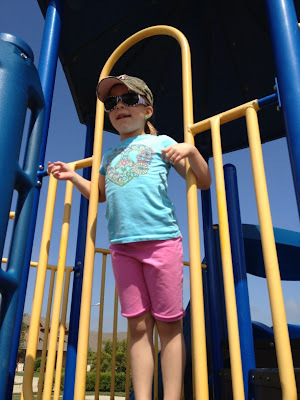 Layla is keeping her wound covered with a ball cap and sunglasses. She is getting tired of her camping ball cap though. We are on the lookout for some cute ball caps for her to wear since she needs to be covering that eyebrow for the summer. I love this picture of my sweeties! 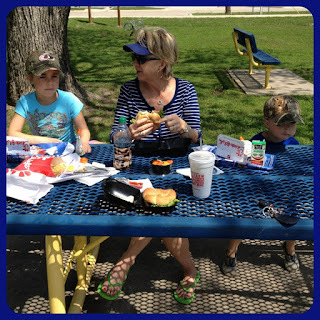 After we played at the park we enjoyed a picnic lunch. The weather is just amazing! We are just loving these fun spring days. Momma played with dye today...uh oh! Actually it worked out just fine! I love the throw rugs from Target. I usually get new rugs once the old ones get grungy looking. Target rugs are the best for our household because they can be washed when we spill on them. They are also less than $5 a rug and that is good for me because I like to get new colors when I get tired of my current rugs. Well, shame on Target I haven't been able to find my favorite rugs. I decided to dye the rugs I have until I find new rugs. I sorta really just wanted to play with dye too. heehee! Here they are: faded and dingy. And then after a few spins in the washing machine they are so much better! They aren't quite as dark as I hoped. I was thinking they would be a bit darker, but I like the way they turned out. While I was waiting for the washer to agitate the dye water I boiled water for jello jigglers. The kids get so tired of the same old snacks after Layla gets home from school. You can't really go wrong with jello jigglers! The kids used Easter themed cookie cutters to cut out fun shapes to eat. I used 4 boxes of Jello brand berry blue jello and 2 1/2 cups of boiling water. I mixed the jello into the water and then poured it into a Pyrex dish. Then I put it in the fridge for 3 hours. I'm not sure why it took me so long to master the talent of making jigglers, but I just recently got the recipe just right! Daddy was working in his office and heard all the excitement. He ventured out to sample the goodies! Silly girl and her beard. Layla's eyebrow seems to be healing just fine. The stuff underneath the glue is getting darker and doesn't look so pretty, but we are just letting it do it's thing. The glue should fall off in another week or so. We don't want to mess with it or cause her pain. Honestly I wish I could help get some of the glue off of her forehead. It makes her face look dirty. BUT looking dirty for a few days is just fine. I don't want to scar her little face in any way. She doesn't seem bothered by it at all. She is more excited about getting back to her normal activities. The doctor wouldn't let her participate in P.E. or recess. Tomorrow will be her first day back to normalcy and she is very very excited! I hope you had a great Thursday! 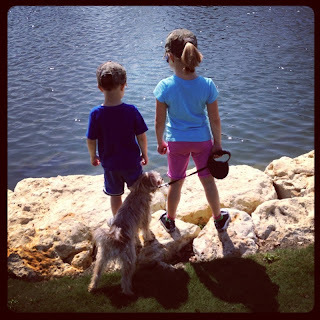 Today we had the best time with Hayden's preschool friends at the Fort Worth Botanic Garden. The coolest part was visiting the Butterfly Garden. This post has some serious picture overload!!! I love the flowers! They are arranged in the shape of a butterfly! If you are in the Fort Worth area you must visit the Botanic Garden. It is beautiful this time of year. I couldn't put my camera down! Hayden had a rough day yesterday. I am so thankful for new days. We have had so much fun today!! Once we were inside the butterfly garden the butterflies were free. They flew all around us and even landed on us. This picture is priceless!! Hayden really wanted a butterfly to land on him, but it didn't happen. Sadly I couldn't take many pictures with my Canon camera. It was so very humid and the lenses fogged up so bad. I was sad, but thankful for my iPhone. All the pictures of butterflies were taken with my phone. I was shocked by the quality of them! There were the most interesting plants on display. It was fun to sit on the lawn while eating our picnic lunch. I enjoyed talking with the other moms. After lunch the kids ran and played baseball. It was a great day. I am so thankful for all the cute buddies Hayden has made at preschool. What do we do when we camp?